In der Arbeit "Vom Verschwinden", welche aus Reflektionen aktueller Geschehnisse jüngster Zeit entstanden ist, geht es ums Abhandenkommen, um den Prozess der Verdrängung und des Vergessens. Die Künstlerin hat die zentralen Sätze der Allgemeinen Erklärung der Menschenrechte, aus dem Jahre 1948, auf Olivenölseifen aus Griechenland geprägt. Zusammen mit der Materialität der Seife erzeugen sie ein inhaltliches Spannungsfeld, das mannigfaltige Assoziationen und Fragen weckt. Zu welchem Preis bleibt Europa sauber? Wer wäscht seine Hände in Unschuld? . The central theme of Eva Borner’s work is the presence of the absent. So too in the work “On disappearing”, which emerged out of the reflection on recently occurring events and which addresses loss – the process of suppressing and forgetting. 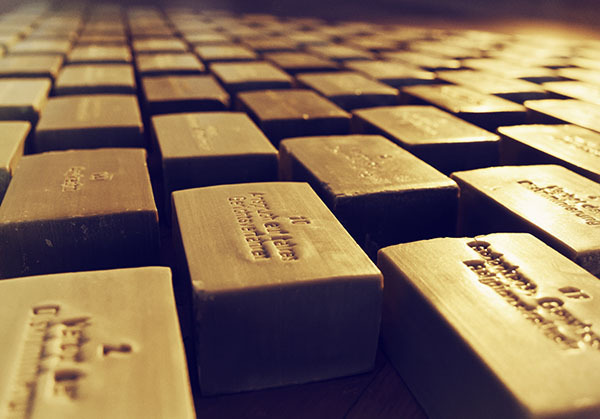 The artist imprinted central passages from the 1948 Universal Declaration of Human Rights on olive oil soap from Greece. Combined with the materiality of the soap, tension on the level of content is thus created, raising manifold associations and questions. Who are they that wash their hands in innocence? At which price does Europe remain clean? Having worked as a volunteer helper in a refugee camp in the harbour of Athens she was able to collect infinite impressions of these stranded people’s difficult situation. Her numerous experiences and her acquain- tances with refugees have been on her mind ever since. They are the reason why she decided to deal with the present political situation in the framework of an art project..